"The Argentine, Schwartzman, is the 14th seed here but that really is due to his performances on his favoured clay, where he excels, and he has zero track record on grass." Yesterday's play at Wimbledon saw rain interrupt the latter matches, although there were still some talking points in the earlier clashes. Roger Federer eased past Lukas Lacko to set up a third-round clash with Jan-Lennard Struff, who won an epic 13-11 final set against Ivo Karlovic in a match which lasted a minute short of four hours - probably not what any player wants in advance of a match-up with Federer on grass. Lucas Pouille was the biggest casualty of the men's draw on day three, and it looked like a fifth set would be plain sailing for the Frenchman, having fought back from two sets down against Dennis Novak, but the Austrian pulled a 6-2 final set win out of the bag to triumph - his reward is Milos Raonic in round three. Our outright pick, Marin Cilic, is two sets to the good against Guido Pella overnight, while Wednesday's handicap recommendation on Andreas Seppi is still awaiting settlement, with his match against Kevin Anderson into a fourth set. Two 6-3 set losses for the Italian isn't a positive, but our pick is still alive. With the rain-interrupted matches adding to 16 further round two matches, today's schedule is a packed affair and there's some interesting spots to discuss. Marcos Baghdatis came into Wimbledon with no form or fitness to speak of, but took advantage of Dominic Thiem's retirement to meet Karen Khachanov today. The Russian, Khachanov, is improving rapidly but does look short at [1.35] against the Cypriot veteran who loves grass, and has performed very well on it in the past. Another veteran, Julien Benneteau, has a solid record on the surface and this is very likely to be his last Wimbledon. 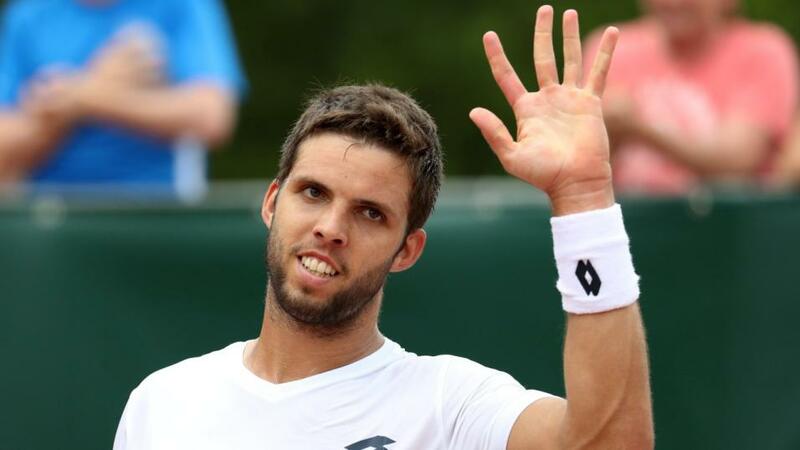 Today he faces another improving player in Frances Tiafoe and it will be interesting to see whether the wily Frenchman can use his experience to progress to round three. The market finds it hard to split the duo, with Benneteau currently [1.90], and I made him a slight favourite here. Feliciano Lopez is another ageing player who has an excellent record on grass and I'm surprised to see him so big as [1.37] against Juan Martin Del Potro, particularly given that the Argentine may not be 100% fit. The match should be pretty tight with both players having projected hold percentages in excess of the ATP mean figure, and I feel Lopez is a little under-rated by the market for this. However, I want to focus on a match where the market feels the two players are a little closer to each other, in the shape of Diego Schwartzman versus Jiri Vesely. Vesely, having been backed in to [1.88], is the marginal favourite, but is an opponent who has had a poor year in truth. However, there are signs that the Czech man is turning things around, reaching the semi-final in Antalya last week, and he had a good win over Florian Mayer in round one. While Mayer is undoubtedly in huge decline, he has an excellent grass record and Vesely creating 22 break point chances in 19 return games is a huge positive. The Argentine, Schwartzman, is the 14th seed here but that really is due to his performances on his favoured clay, where he excels, and he has zero track record on grass. In fact, he's 1-5 in the last two years on the surface, with his win coming against the mediocre Mirza Basic in round one here, and he's held serve just 66.7% of the time in those six matches. Vesely on the other hand is 9-5 in this time frame in main tour matches, holding 89.2% and breaking 16.4% - while his serve numbers are flattered a little due to saving higher amounts of break points than expectation, he's still shown himself to be a much better grass courter than Schwartzman. I'm more than happy to side with Vesely at [1.88] here against a player who has shown practically no signs of ability whatsoever on the surface in his entire career. In other matches, we see Rafa Nadal in action against Mikhail Kukushkin, and Novak Djokovic faces Horacio Zeballos. Both are virtually guaranteed to progress, according to model and market prices.